Today May 21, 2011 is Judement Day? The End of The World? | Is This The Beginning Of The End Of The World? NBC's Kerry Sanders reports on the Rapture claims for "Nightly News." 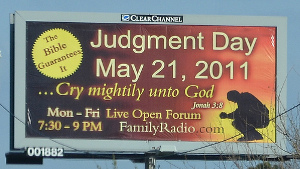 You may have seen the billboards or seen it in the media some where that we are in the count down for the May 21, 2011 judgement day. For today to be the end of the world. The prediction had been made years ago by Harold Camping a religious preacher of a worldwide family radio broadcasting station. That on today, it would be judgement day. Look at the video to hear how Harold came up with today's date for this event. His prophecy is based on calculations so kooky that other end of times prophets say he is giving them a bad name. The real question is: Why has there been so much buzz over Saturday's scheduled Rapture? "Obviously, what could be a bigger news story than the end of the world?" Well my friends. If it is judgement day, I would like to say, thanks for being my friend and a reader here on my blog and on my other blogs as well. And may God Bless you and the world! Below, Doomsday prediction has believers preparing, skeptics scoffing. NBC's Kristen Dahlgren reports.